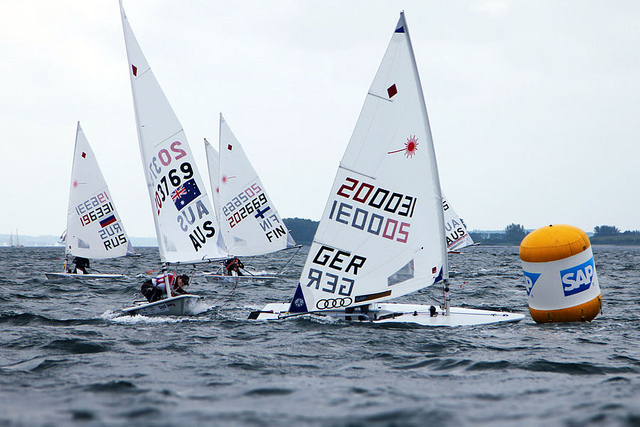 The last qualification races before the split in Gold- and Silverfleets were sailed for the first time in a fresh up to 25 kn breeze causing major changes in the overall rankings. With the day ranks 2/1/1, Silvia Zennaro ITA has taken the lead in the Lasers Radial 7 points ahead of Ecem Gusel TUR on rank 2. Brenda Bowskill CAN jumped on rank 4. In the Lasers Standard, Enrique Arathoon ESA (El Salvador) has taken the lead ahead of Philipp Buhl GER, winner of all 3 heats in his group, reducing the deficit on the leader to one point only. Another points back is Karl-Martin Rammö EST on 3rd. All ranking lists and the daily news .